Did you know that when cats scratch with their claws , they aren’t just “sharpening their claws” or marking their territory? Scratching is also FUN! Cats scratching is the same as dogs chewing—both are natural, normal behaviors that should be encouraged. Every cat owner should provide multiple ways in which cats can engage in scratching behavior… without ruining the furniture. By purchasing a scratching post or other surface and placing it near the place where the cat is scratching, you can often redirect the cat to scratch on that object instead. However, don’t think you can just buy a cat scratcher and put it in the corner of the living room. Cats like to scratch and mark their territory in places where people often come and go. Think of your scratching post as a literal sign post—you want to put it where people will see it. Try putting small cardboard scratchers near doorways, windows, or other high-traffic areas, against a wall, and watch your cat go to town. 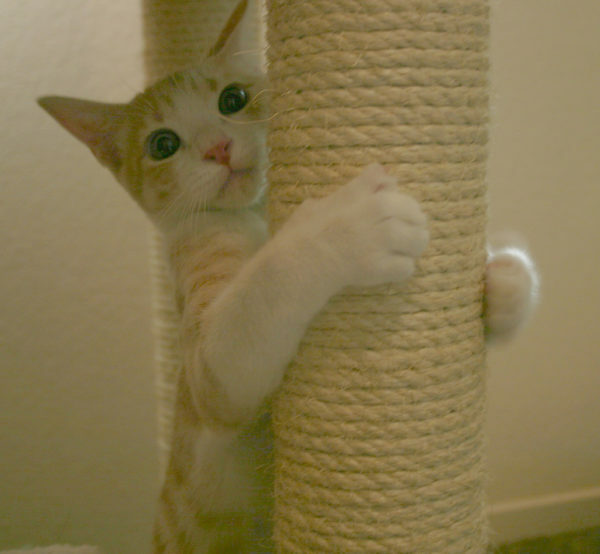 If a cat isn’t using a scratching post, try putting it in a new location or sprinkling it with cat nip. Scratchers will wear out over time, so be sure to replace them if the cat no longer is interested. Don’t forget: Cat nails grow in layers, like a tree. When you clip your cats nails you may notice a large amount of nail flake off after you clip. This is the dull, outer “husk” of the nail, which is normally removed by scratching. If the cat isn’t scratching or if the nails aren’t clipped, overgrown nails can lead to nail bed infections or pain, ingrown nails. There are many ways to control scratching in a cat—and declawing should never be considered except in extreme circumstances—declawing is illegal in many places and may soon be illegal in California (Bill AB1230). Please speak with your veterinarian or trainer regarding other ways to promote healthy scratching.